The tour of the Internationale Junge Orchesterakademie 2018 will begin with the concert in the Ordenskirche St. Georgen tomorrow at 8 pm. 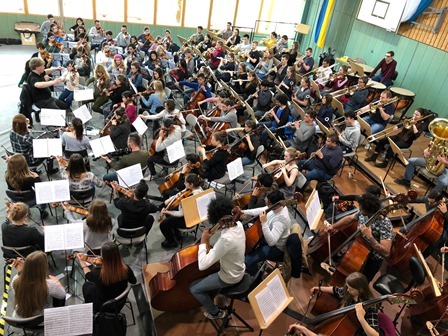 97 musicians from 37 nations have practiced in the rehearsal phase in Pleystein among renowned teachers and will show what they have learned in the time. After 2013 Matthias Foremny, professor for conducting and choral conducting at the Leipzig Academy of Music and Theater, 1st permanent guest conductor at the Leipzig Opera and principal conductor of the Stuttgart Chamber Orchestra, will be conducting again.